Andrews McMeel Publishing, 9781449470944, 144pp. Batman and Robin meet Rocky and Bullwinkle. 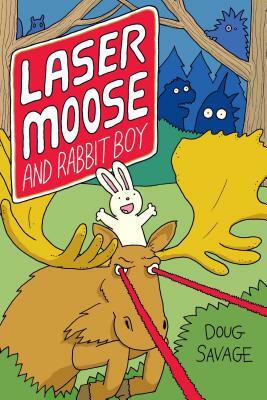 Through a series of fun adventure stories, Laser Moose, who can shoot lasers from his eyes, and his sidekick, Rabbit Boy, endeavor to save the forest from looming threats. Get ready for hilarious, action-packed, laser-powered adventures written and drawn by Doug Savage, creator of the popular comic Savage Chickens. This is Savage’s first graphic novel. Savage Chickens began on a rainy day in October 2004 when, after one too many migraines, Doug Savage scribbled two chickens on a sticky note. Almost eight years and 2000 cartoons later, Savage Chickens is now a popular website with millions of readers. Savage still draws every cartoon on yellow sticky notes, and his cartoons cover an eclectic range of topics, including: work, psychology, arachnophobia, pop culture, cats, time travel, love, zombies, and more.